Arguably, the most exciting way to catch a Sailfish. The sheer exhilaration of seeing a lit-up Sailfish smash the teaser all the way to the boat is sure to get your adrenaline pumping. We troll teasers and stitch baits to entice sailfish up to casting range. All you need to do is cast the fly 25 to 30 feet. Many people worry about it, but in actual fact, it is much easier than it is perceived to be. You will be fully guided through the whole technique, so even if you have never done it before, rest assured that you will get a good shot at a Sailfish. With our experience guiding fly-fishing charters out of Rompin since 2006, we are happy for you to benefit from our on-water experience and expertise, which we are always ready to share. Whilst the method of tease and switch takes coordination between the skipper, angler and teaser man, we will practice till our anglers are fluent before doing the real thing. Frisky Sailfish have been known to come up and “mess up” our practice sessions… which just adds to the fun. It will seemingly be the shortest five seconds in your life to get ready to cast and the longest five seconds you wait for the fish to take the fly and turn before the hookset. Nothing beats the feeling of landing your first ever Sailfish on fly! With the cost of a heavy saltwater fly outfit being what it is, should you want to give it a shot, but not already own suitable tackle, then this is the charter for you. All fly gear down to terminal tackle and flies are supplied unconditionally so you don’t have to worry about damaged tackle or lost flies. We recommend and use only Cam Sigler and our custom made flies. We also stock these flies should you wish to purchase some to take home. Fly anglers bringing their own tackle should come minimally with a 12wt outfit with a WF floating line. Whilst some claim that you can free cast to a sailfish, we can assure you that our statistics continually demonstrate that the best way is still to tease the sailfish up and get them more aggressive to hit the fly. Early season (mid-March to early May) usually sees smaller but more aggressive sailfish, which makes them an ideal quarry on fly. All teasing equipment is supplied and all stitch baits will be prepared before hand so you won’t have to waste any time looking for bait. 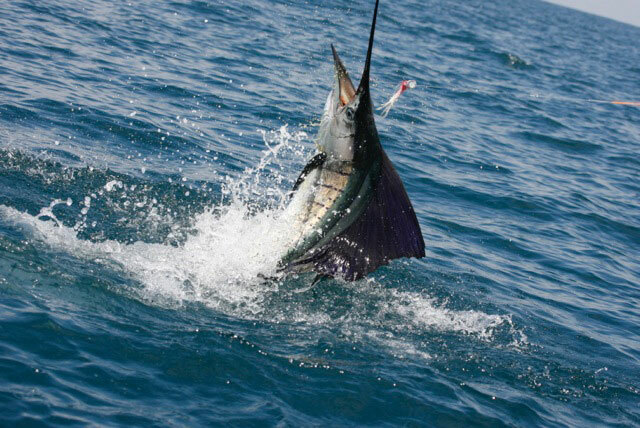 The teasers go immediately into the water upon reaching the Sailfish grounds. We guarantee you a full day’s trolling/teasing with a half hour lunch break should you book a fly-fishing charter with us. 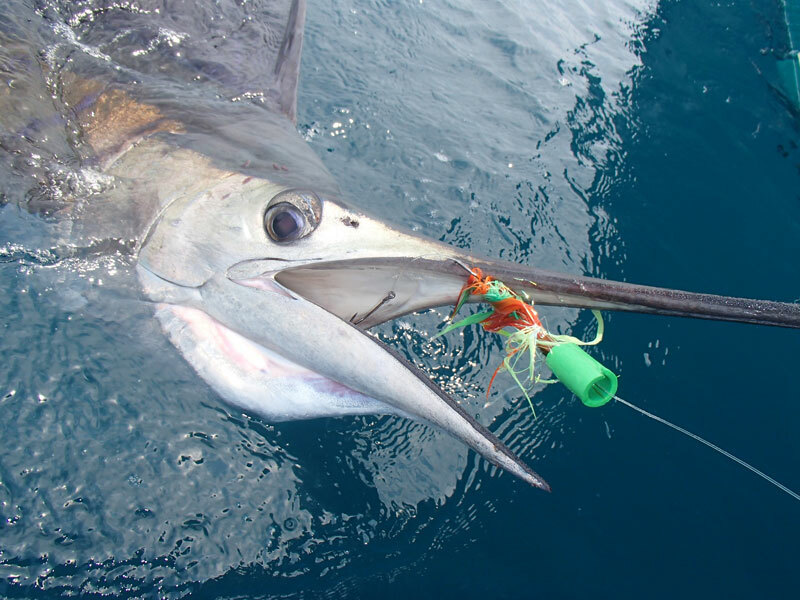 For single anglers looking to share a boat to target sailfish on fly, shared charters are available. Please contact us for planned dates. 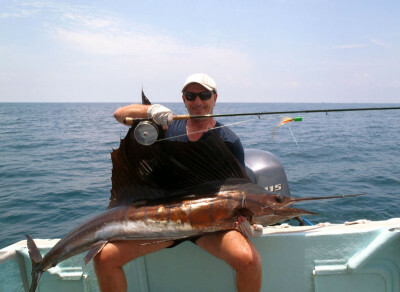 Inquire now about our Sailfish on Fly itineraries and packages to Rompin. We can tailor a fishing expedition to Rompin specifically to match your specific requirements. Come fulfill your wish to land a Sailfish on Fly, FishZone will guide you all the way.